THE GIRL EFFECT, n. — The powerful social and economic change brought about when girls have the opportunity to participate. The focus of this blog has been on women’s consumerism and marketing to women. But in looking at the power of today’s women, we can’t ignore the power of the next generation of women around the world. I recently connected with a wonderful program called The Girl Effect – perhaps the greatest untapped solution for young girls in developing nations. An adolescent girl is uniquely capable of raising the standard of living in the developing world and the community in which she lives: she will reinvest her income and knowledge back into her family and her community. As an educated mother and an active citizen, a girl will break the cycle of intergenerational poverty. That’s The Girl Effect. But despite her proven potential, she is also more likely to be uneducated, a child bride, and exposed to HIV/AIDS. Less than two cents of every international development dollar is directed to adolescent girls. And excluding these girls doesn’t just impact them, but the world at large. The Girl Effect is the powerful social and economic change brought about when girls have the opportunity to participate. It’s an untapped force in the fight against poverty, and it’s driven by champions around the globe: the Nike Foundation, the NoVo Foundation, the UN Foundation, the Coalition for Adolescent Girls, CARE, Plan, the Population Council, ICRW and the Center for Global Development – and many others. Little research has been done to understand how investments in girls impact economic growth and the health and well-being of developing communities. This lack of data reveals how pervasively girls have been overlooked. For millions of these girls, there have been no systems to record their birth, their citizenship, or even their identity. They are virtually invisible. However, existing research suggests their impact can reach much further than expected. She’s the economic backbone of her family: the chore doer, the caretaker, the insurance policy. She’s the mother of the next generation. She will reinvest 90 percent of her income into her family, generating a powerful ripple effect. Her brother? Thirty to forty percent. When she’s educated through secondary school, she’ll bring 25% more income into her family. When she’s healthy, her community’s health will improve as maternal mortality and child malnutrition drop, and HIV rates decline. An extra year of primary school boosts girls’ eventual wages by 10 to 20 percent. An extra year of secondary school boosts wages by 15 to 25 percent. But one-quarter of girls in developing countries are not in school. More than one-quarter of the population in Asia, Latin America, the Caribbean, and sub-Saharan Africa are girls ages 10 to 24. One girl in seven in developing countries marries before age 15, and 38 percent marry before age 18. What can you do? Help make these 600 million girls visible by becoming a fan of The Girl Effect on Facebook. Tell the world that you think these girls deserve better – for themselves, and for the end of poverty. Why Would Brands Ignore These Women? Why Do Brands Ignore Baby Boomer Women? The other night I got together with several of my friends for an evening of girltalk. One friend is a mom and business owner who recently bought a new car. Another is an empty-nester who just purchased a refrigerator and dryer. A third is a recently-divorced healthcare industry executive who just bought health insurance for herself and her daughter. And finally there’s me: the CEO of a marketing company who last month purchased new office equipment and a widescreen TV. All of these purchases were made by Boomer women, without input from a spouse or significant other. Because I’m a Boomer woman and specialize in the marketing-to-women space, I’m particularly conscious of how I’m treated by brands. And while I am of a certain age, I’m certainly not ready to be stored in the attic. And neither are my friends. Yet, as Boomer women we’re continually marginalized by brand managers (primarily male) who don’t think any women of value exist over the age of 39. In addition, this group of women will experience the largest population growth over the next 10 years, and the largest transference of wealth from inheritances left by parents and husbands. Yet rarely if ever does one see a marketer’s target audience that extends beyond the age of 49 unless it’s for the senior market. Why? Marketers and the media need to finally realize that the women most ignored are the ones who can do the most good in an economy that continues to struggle. The time of patronizing ads and ignorance is long gone. Does your brand ignore the largest and fastest-growing spending segment of women? Or are you one of those women that are being ignored? 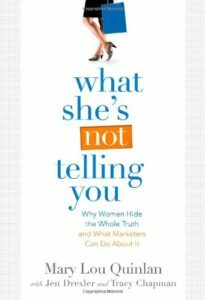 A few posts back I touched briefly on how the book What She’s Not Telling You highlights an interesting behavior by the female consumer –– the habit of telling the “half truth” vs. the “whole truth.” Understanding this concept is so important to marketers that I decided to revisit. “I am happy with my looks” (half truth); “If given a choice, I’d like to look better than I do” (whole truth). An example of how a half truth can negatively affected a brand is Dove’s “Campaign for Real Beauty.” This campaign broke the rules of the beauty business by putting less-than-perfect women in their plain white undies all over billboards, the media and the Internet. Talk shows went crazy and Dove was hailed as the brand that “gets it”. The PR value of the Real Beauty campaign was unparalleled. But soon after, Dove’s sales slowed and eventually flatlined. Why? Because Dove fell for the half truth that women want to feel good about their natural looks. But the whole truth is that women really want to look better than they do, which is why they spend $7 billion annually trying. On the flip side, Procter & Gamble’s Oil of Olay identified this whole truth: “Just because I’ve earned these facial lines doesn’t mean I want to wear them,” and marketed their Pro-Age Regenerist product based on the whole truth that women want beauty products that really work. They marketed Regenerist as an alternative to invasive cosmetic surgery, and the launch became the biggest skin care launch in the mass market. Are you identifying the whole truth when marketing to women consumers? What half truths have you told a brand?